Though President Donald Trump promised to protect LGBTQ people, his administration has entirely undermined equal rights gains for the LGBTQ community in America and around the world. Instead of standing up to the 76 countries around the world that have laws targeting LGBTQ communities, the president has largely abstained from supporting human rights resolutions and tacitly thrown in his lot with nations who persecute LGBTQ individuals like Saudi Arabia. As the White House sits idly by, repressive regimes continue to inflict terrible political violence, extortion, and blackmail on sexual minorities. America requires a new brand of leadership that will ensure LGBTQ rights are a key component of a morally centered American foreign policy. We can do so by advancing three key areas: an ambassador-at-large for LGBTQ issues, an international treaty on the rights of the community, and a dedication to the fostering of local to global connections as a foreign policy priority. The progressive foreign policy agenda for 2020 should not just reverse the homophobic and anti-woman vitriol in our international mission, but build beyond the success of the Obama era. Under Obama, America was the first country to establish a “Special Envoy” diplomat to advocate around the world regarding LGBTQ issues. Randy Berry, a career diplomat, served for two years, globetrotting advocacy for the basic human rights of LGBTQ persons. Though Berry’s appointment was a remarkable first step (later undone by Trump), we can do better in 2020 by establishing an ambassador-at-large for LGBTQ rights. This ambassador’s job would be to promote core protections and inclusion principles at the top levels of global diplomacy. The United States has historically leveraged ambassadors-at-large in several areas where the president and Congress wish to amplify an issue, including human trafficking, religious freedom, war crimes, counter terrorism and women’s issues. A new position on LGBTQ issues would allow the State Department to target problem areas with a high-level delegation and resources. For example, the ambassador could be called upon to make the public case for including LGBTQ protections in the United Nation’s sustainable development goals, similar to how we led the inclusion of women’s rights in the document years ago. Additionally, the ambassador would work with countries like Russia to prevent blocking of symbolic pro-LGBTQ resolutions. Most importantly, appointing such an ambassador would display a serious and meaningful break with the Trump Administration, which shamefully has pulled the United States out of the United Nations Human Rights Council. Therefore, as the 2020 Democratic field takes shape, we must push to ensure that candidates support the idea of such a roving ambassador, for this will be demonstrative of the values needed in the White House to protect and promote all human rights. The next president, as well as Congress, can further counteract the Trump Administration’s actions by demanding an international treaty protecting the rights of LGBTQ people. The United States and our allies can use our considerable power to condemn countries like Russia, Saudi Arabia, Uganda, and other human rights violators on their terrible policies. This will help prompt a cascade of accountability in the international arena, in which regimes are pushed to gradually make concessions. We have seen U.S. leadership in international agreements in the past – protecting children, women, and religious minorities, and prohibiting the proliferation of weapons of mass destruction – and the next progressive foreign policy priority must be the creation of a global treaty on protecting LGBTQ minorities. Harvey Milk was right: the more folks come out, the more visible the community, then the more accepted and included they are. This is true at home and abroad. Therefore, we should cultivate and fund public diplomacy between LGBTQ serving organizations here and around the world. This type of work already has its foundations: For example, in San Diego, the local Pride is a 501c3 non-profit organization that helped to found the international association of Prides, InterPride, in 1981 and hosted the first international Pride conference in 1984. Those early beginnings have subsequently built a growing global network of LGBTQ individuals and organizations through mostly volunteer-run efforts as these organizers share resources and best practices. 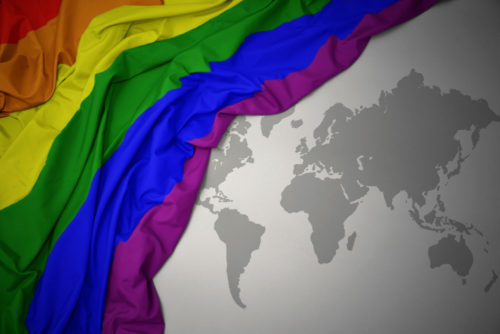 While Pride in New York City may be very different than Pride in Latvia or Nigeria, many of the harmful legal and social impacts the LGBTQ community faces in the different parts of the world have been faced domestically and can be deconstructed more easily if confronted strategically with international support. The U.S. government should also foster local-global partnerships. For example, through partnerships with the Department of State, San Diego Pride has worked with 423 delegates from 127 countries on LGBTQ policy best practices in just the last few years. These partnerships created the Pride World Forum, where LGBTQ activists from across the globe are able to have a platform to showcase the work being done to support equal protections in their respective nations and the challenges they face. These programs help to establish and strengthen international bonds, while also connecting organizers to strategies, resources, and funding opportunities that would have otherwise been inaccessible. In 2018, an expansion of San Diego Pride’s international education and advocacy efforts took the form of “Orgullo Sin Fronteras” (Pride Without Borders), a binational LGBTQ leadership development summit, funded in part through the U.S. Embassy in Tijuana, Mexico, which saw more than 200 attendees- highlighting the desire for more of these types of programs. These issues should be the foreign policy backbone for anyone seeking progressive support for presidency in 2020. In the meantime, with 2018 elections approaching, all politics are local. Activists must ask candidates how they will lead on LGBTQ issues and whether they support such measures as a roaming ambassador, an international treaty, and funding for activist-to-activist trainings abroad. We must demand this as part of the progressive conversation in 2018 if we are to accomplish these things in 2020. Joel Day, Ph.D. is Security Fellow of Truman National Security Project and Visiting Scholar at the University of San Diego School of Peace Studies. Fernando Lopez is Executive Director of San Diego Pride. Views expressed are their own.